Geography and size: Glenville is a picturesque community 10 minutes northwest of downtown Greenwich. Geographically the boundaries of Glenville begin midway up Glenville Road and run west over to Weaver Street and all points north up to the Merritt Parkway. Parks/playgrounds/marinas/beaches: There are no parks, marinas or beaches in Glenville but there are two playgrounds/ball fields at the Western Greenwich Civic Center and the Glenville School. Recreational membership clubs with facilities: The only membership club with a facility is the Bailiwick Tennis and Swim Club on Bailiwick Woods Circle in the area’s northern boundary. Shopping and restaurants: Most shopping in Glenville is focused in the Glenville Shopping Center or the small shopping and office complex known as the "Mill." The shopping center has a supermarket, dry cleaners, post office and ancillary stores while the "Mill" features two restaurants and variety shops. Additionally, at Glenville's hub at the intersection of Riversville Road and Glenville Road, there is shopping, three restaurants. Transportation: The nearest train station to Glenville is the Greenwich Train Station approximately two miles to 2 ½ miles away. 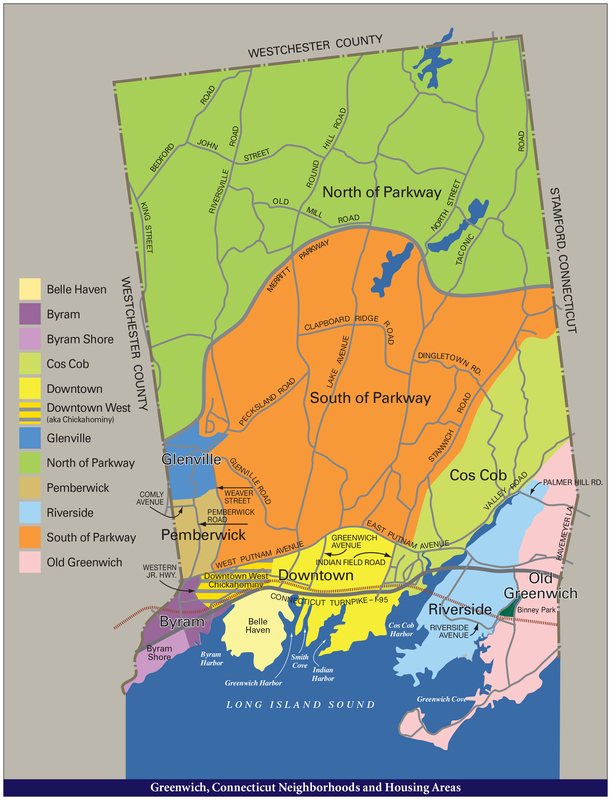 The closest major roadway is the Merritt Parkway while West Putnam Avenue (Route #1) is less than a mile and Interstate 95 is approximately two miles. There are no Connecticut Transit bus stops in Glenville, the nearest stop being in central Greenwich at the Greenwich Train Station. Travel time to mid-town Manhattan, no matter the mode of transportation, is between 35 minutes and 55 minutes. Neighboring Stamford is no more than 20 minutes away.